Tomorrow, America First Policies will be holding an event featuring Vice President Mike Pence in Pangle Hall on Lee University’s campus. For security measures of this event, several downtown road closures will be taking place. 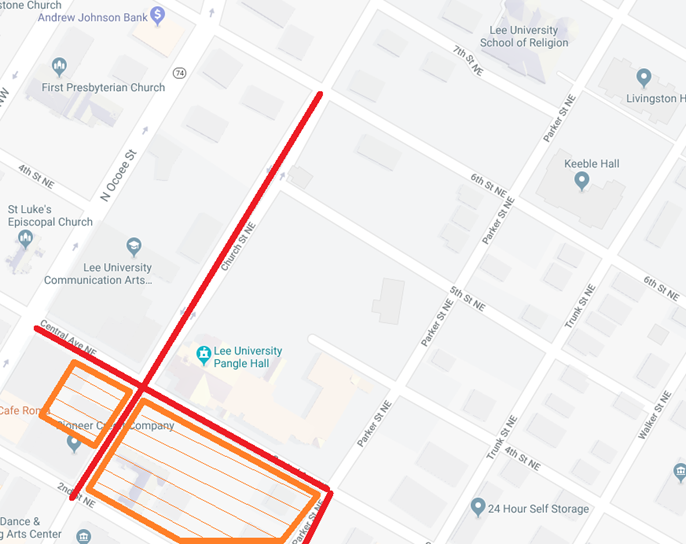 Central Avenue will be shut down between Parker St. and Church St. Also, if a vehicle is parked in the city parking lot adjacent to Lee University’s School of Business on Central Avenue, an alternative location for the vehicle will need to be located prior to lunch. Please try to refrain from parking your vehicle in the highlighted areas.There is a possibility your vehicle will not be allowed to be moved until Saturday afternoon. Central Avenue between Parker and North Ocoee St. will be closed beginning Saturday morning until mid-day. Church Street from Inman to 6th St. will also be closed during this time. Please review the map below for reference. Information provided by Lee University.